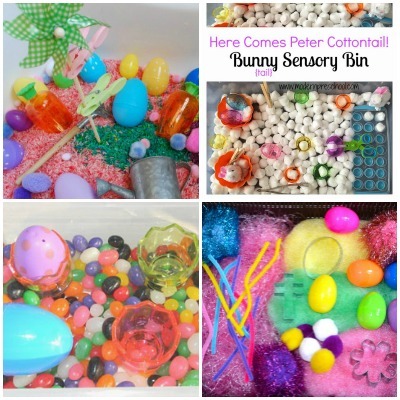 This week – we’re all about Easter sensory activities! I’ve rounded up some fun Easter sensory bins as well as some other hands-on Easter activities that will get your kids working those fine-motor skills while exploring different materials in creative ways! My son loves sensory activities of any kind, but it wasn’t always that way. When he was a toddler, he hated getting “messy” and avoided play dough, cloud dough, or anything sticky. However after reading about the benefits of sensory bins and other hands-on sensory activities, I kept creating new bins for Onetime, and encouraged him to explore the messy ones too (sometimes with plastic gloves on!). At 3 1/2 his fine-motor skills appear to be developing very nicely and I attribute a lot of that to all his hands-on experiences and play with different materials. For Easter this year, I went looking through the Love to Learn Linky to find some new ideas for sensory fun and found some really unique ideas. I hope you’ll enjoy exploring these too! 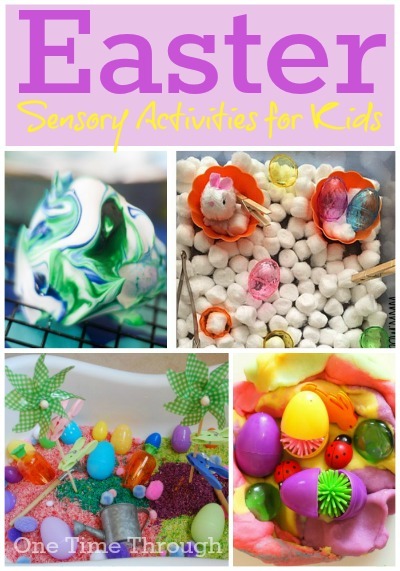 Hope you found a fun Easter sensory idea for your kids today! A Little Pinch of Perfect – All Things Easter Eggs!